Carrot Blood Orange Cupcakes - Do You Know The Muffin Man? Notes: With all that leftover buttercream, I reluctantly decided to make some cupcakes. Changes from the linked cupcake recipe: halved quantities to make 12 large cupcakes, blood orange instead of regular, plain milk curdled with a squeeze of lemon instead of buttermilk, 2 eggs instead of 1.5. These turned out great, especially right out of the freezer (I put the frosted cupcakes for 15 minutes to help set up the buttercream which was beginning to split). 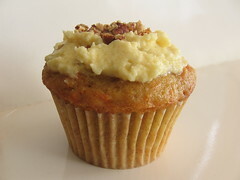 The flavour is similar to a light carrot cake, very moist and fluffy, with great toasted pecan crunchiness.